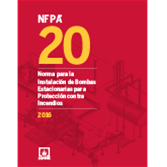 The 2016 NFPA 20 in Spanish expands requirements to cover new technology and address communication gaps. Now with first-time requirements for multistage multiport pumps that give designers and engineers more options. Added coverage of multistage multiport pumps -- which are used primarily outside of North America -- offers new options to system designers and engineers. These pumps replace a series arrangement, with new potential for end-user cost savings. Clarified criteria for series fire pumps will impact communication between rooms. The Spanish 2016 NFPA 20 clarifies the requirements for fire pumps arranged in series with new information designers and contractors will need to know to install these types of pump arrangements correctly and ensure they can communicate as intended. In another change, the added Annex C, Fire Pump Controller Connectivity addresses remote communications from the fire pump controller to an external source to gather system performance data over the Internet. Avoid pump failure or damage.